Seminar paper from the year 2009 in the subject American Studies - Linguistics, grade: 2,0, Martin Luther University (Anglistik und Amerikanistik), course: Text Types in Computer-Mediated Communication, language: English, abstract: These days, modern technology has had a strong impact on people's everyday lives. A relatively recent phenomenon in the history of computer-mediated communication (CMC) is the enormously spreading popularity of social network sites (SNSs). A diverse and comparably large amount of CMC takes place on these online social networks in which users have to deal with various communication channels and face new challenges in terms of online privacy. In order to find a balance between the exchange of (private) information and keeping a certain degree of privacy, users need to develop a certain communication and language behavior which this paper is going to study. 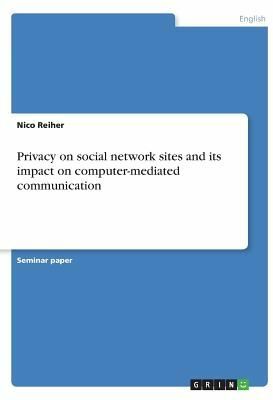 In this context, Chapter 2 gives a general overview of basic theoretical knowledge in order to find an approach to the impact of privacy on SNS. It regards the creation of virtual identities and examines the concept of face. Furthermore, the chapter examines the phenomenon of privacy concerns related to CMC in general. The third chapter of this paper focuses on the topic of SNSs considering its self-contradictory nature more closely. On the one hand, they demand private data in order to attract curiosity and interest. But on the other hand, they lack privacy to a certain degree and have, thus, aroused a huge controversy. Moreover, this chapter features an explanation of the term "friends" and its extraordinary use in a SNS-related context. Finally, the chapter considers a recent study by Lewis et al. (2008: 79-100) which looked at the privacy behavior of students on SNS. Chapter 4 offers and studies some text type examples which describe and explain the use of both transparent and private SNS communication channels. In this context, it approaches a text type example of a status line, a.